21:00 Deathmatch Preparation 10 minutes to prepare for Deathmatch. 21:40 Castellan Preparation 10 minutes to prepare for Castellan. Only clan leaders and vice commanders can register. Any clan above Elite Knightage (Accredited Knights) Grade 5 can register. The registration fee is 100,000,000 Noah. Registration is limited to the first 30 clans who sign up. Registration period starts from the end of Castle Siege War until 2 hours before Clan Deathmatch. Eligible clans can register through the NPC Aaron in Moradon. If no clans register for Clan Deathmatch, CSW will not take place during that week. If there is only one clan registered for Clan Deathmatch, that clan will be moved to Delos and CSW will begin directly. If Clan Deathmatch happens to end early, CSW will begin on time. Only 16 players can participate on behalf of each clan. Barracks can be deployed by Clan Commander or Vice Commander using "/base" command. Clans that did not deploy their barracks during the preparation period will be kicked out of Delos when Deathmatch begins. You cannot deploy your barrack next to objects on the map. Barracks can only be damaged by basic attacks. Each basic attack deals 1 damage to the Barracks. When a Barrack’s HP reaches 0, it is destroyed. Strengthening skills can be used for clan members during the preparation period. You cannot attack your enemies during the preparation period. Players will lose NP when killed by enemies. NP loss will be the same as Ronark Land. Additionally NP can be gained by killing enemies. NP gains will be the same as Ronark Land. Ladder Points can also be earned by killing enemies. The clan that destroys the barracks gets 1 point on “Barracks” tab. Characters that destroy or attack barracks will receive Nation Points. Players will respawn at his/her barracks. /town command will spawn you near your barracks. The barracks area of the Delos map are contained within the following coordinates: Lower Left [323, 360], Lower Right [711, 360], Upper Left [323, 615], Upper Right [711, 615]. Clan Deathmatch lasts 30 minutes. At the end of the Deathmatch, the top 3 clans will proceed to Castellan War even if their barracks have been destroyed. If the number of destroyed barracks are the same on each side, the winner is selected based on the number of kills. If the number of destroyed barracks and kills are the same, the clan who registered to Clan Deathmatch first will win. The top 5 clans in the Deathmatch will be rewarded with a Siege War Reward Chest and New Cape Voucher. Players who exit the game during the Clan Deathmatch will not receive the reward. Rewards will be sent via in-game mail to ranked clans. New Cape Voucher (7 days) will be sent directly to clan commander’s mailbox. If the allied clan wins the New Cape Voucher (7 days), it will also be sent directly to the commander of the main clan. 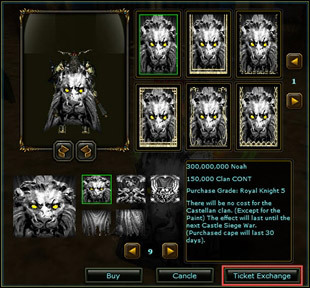 New Cape Voucher Item can be exchanged at the Cape Merchant NPC. Rewards can be exchanged with NPC [CSW Manager] Aaron in Moradon. Here is the list of items that you can get from the Siege War Reward Chest. The top 10 clans from the Deathmatch will be eligible to join Castellan War. Clans can join Castellan War with 50 of their members. The clan which holds the Center Artifact at the end of the war will become the Lord of the Castellan. 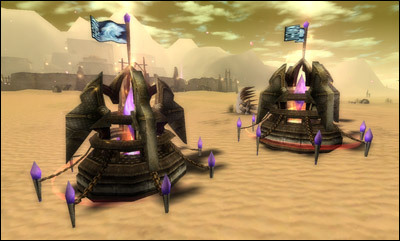 The Center Artifact will be constantly renewed during the siege war. 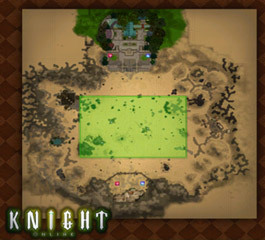 When the Center Artifact broken, the owner clan will remain in the castle and attacking clans will be sent back to town. Defenders may use Siege transform any where or any time. Attackers can use Siege transform from 100 meters away. Owners of the Center Artifact can move into the castle by using the "/town" command. The attacking clans will be moved back to the Safety Zone. There is no penalty upon death while in Siege, such as loss of XP, NP or Noah. Castellan owner clan members can not enter Delos during Deathmatch. 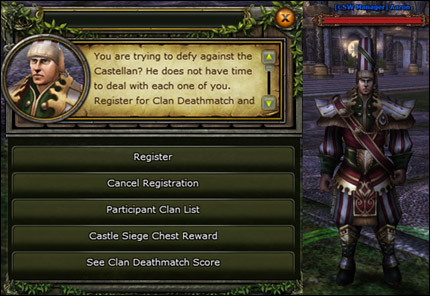 Castellan owner clan members can enter Delos once the Castellan War preparation period has begun. Moradon and Delos taxes can be adjusted by the Castellan owner clan’s leader through NPC [Castle Manager] Captain Hugo. Castellan owner can adjust the tax rate between 0~20%. Castellan owner can pick up stored Noah from [Castle Manager] Captain Hugo at Delos. Pathos' outpost troops were assembled in Delos Northern Eslant River Delta!! The Lord of Delos Idid started reading a short letter which was tied in the homing pigeon's leg. Respectful and flowery words towards the lord, it was just one sentence without any signature of sender. The dark blood on the letter was telling him it was an urgent situation. Idid grew up listening to Adonis' six continents, Delos was just a small country were wanderers stayed to take a break. The opposite area of the river was formed with endless sand mountains. Every time the strong winds passed, a path appeared for the merchants and the path always changed. A vast amount of products were being trade but then...the Orcs in the North valley happened. When the village leader and father of Idid died due to an Orc Invasion, he was only 17 years old. As ubari family's tradition, Idid became the leader of the village…, He built a storage and extended the inn with several young followers. Idid's actions were seen as crazy for the villagers. Delos was just a place for wanderers so they could take a break from their every day merchant travels. There were 5 main groups of merchants who visited Delos. 10 years later, Delos changed. Eslant's village was widely known by the merchants all around the world as the years passed and visitors doubled during this time. His second action was to reach all the Orcs and turn them into his mercenaries. Although the merchants in Delos had to pay for protection, the number of merchants increased. And finally, Idid built a market in where the 6 continent's merchants could freely trade. During that time, a huge castle was also built in Delos. Delos became the richest city after 30 years. Delos city, the place where the continent's paths meet. It was true, all the riches moved to Delos. When the battle began, the nation of barbarians 'Brindo' and also the city of white magicians 'Ardream' was destroyed and got on fire. The small city of Delos wouldn't eventually be able to avoid the ruin. However, Idid did not lose hope. He used all the wealth in Delos to call up all magicians and formed the biggest magical position. Aegis would move Delos to another place, away from the continent until the battle ended. The Magical point was working as Idid commanded. The People who didn't believe the huge castle would be moved, just started watching it happen. The Magical point was not as fancy as people expected. There were no feast of lights or any fantasy. When a strong sand wind came to the city, the only thing left was Eslant river's branch and sand slope. The city was gone. Was it because there was no person to deliver the news? The Battle ended after Pathos moved to Manes' magical point. Even then, there was only Eslant's branch, a sand slope. After 70 years, the story about Delos was just spoken by old warriors. For a few days, there was a report from the scouts who investigated Delos. Delos remained intact just like it was 70 years ago. However, there was nothing left…no dead bodies…nothing. There was only a report inside Idid's office about what the magical position was working on 70 years ago. Just with the city left....there was no person to claim the title of the land and Delos was just a no man's land that didn't belong to neither El Morad nor Karus. It was Cartel, the Merchant of Moradon who showed initiative about the opportunity. There was an agreement made: The lord of Delos would keep Cartel safe and Cartel would pay the taxes back. All the knights were talking about the discrimination of merchants. A Period of Chaos. All the knights knew that the person who occupied the castle would become the castle owner. The nation meant nothing in Delos. Strength became the new order. Super HP Shell Catapult Inflicts a set damage on the enemies within a certain radius. HP Shell Inflicts small damage on the enemies withing a certain radius. Super Durability Shell Decreases the durability of enemies standing within 10 meters from you by 2,000. Durability Shell Decreases the durability of enemies standing within 5 meters from you by 1,000. Super MP Shell Decreases the MP of enemies within in a 10 meter radius of you by 20%. MP Shell Decreases the MP of enemies within in a 5 meter radius of you by 50%. Low Level Aqueous Bomb Gives certain damage to target in specific area.